Epic Games' Fortnite will be the first game from the Gears of War studio made on the company's Unreal Engine 4. So said Epic people at the Fortnite panel at San Diego Comic-Con. The Unreal Engine 4 is Epic's new graphics engine, targeted to next-gen consoles and PCs, though the engine is expected to be scalable to allow games to be ported to mobile platforms and weaker consoles. Read much more about the engine here. The engine's blueprint modular development tool makes it easy for artists to create new content, Epic's lead game creator, Cliff Bleszinski, explained at today's panel. He also said it hales make the game look more clear and have animated skies, which... probably made more sense to our man Mike Fahey who is at the panel than to us here in the home office. Yay for clear, animated skies! 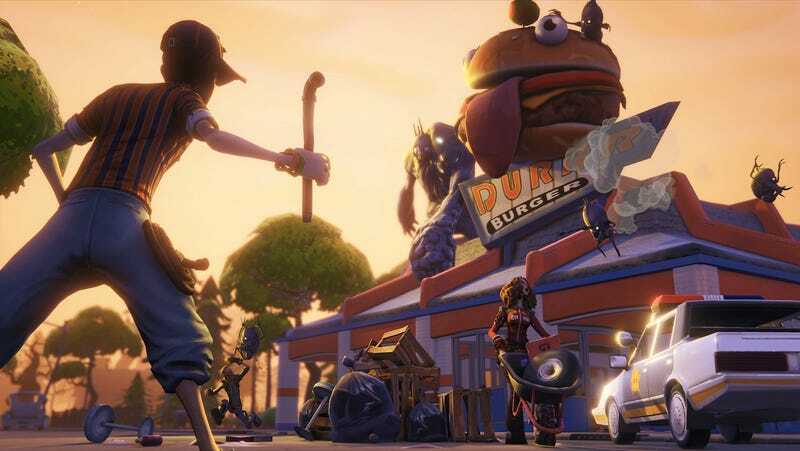 Fortnite is a post-apocalyptic class-based multiplayer strategy-action survival game that runs on a day-night cycle. By day, players will scavenge the landscape, building fortifications, setting traps and doing whatever else it takes to plan for the night. At night, enemy monsters will attack and, hopefully, your day-planning will have have been good enough to get you through the fight. Updated with new screenshots which give us our first look at a game made on UE4. Update 2: Bleszinski says the PC is the game's "primary" platform, leaving the door open for console versions.